For years, the top of the Olympic and world championship podiums seemed off limits to Damian Warner because of the dominance of a friend and rival. 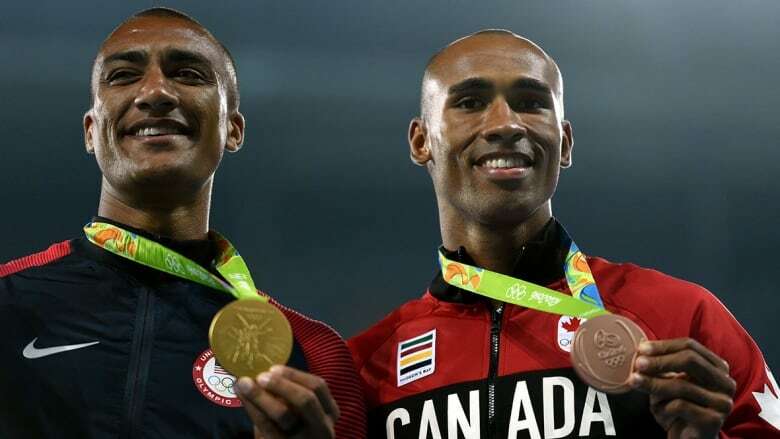 But with Ashton Eaton now out of the picture, the Canadian has his sights set on gold. If there was ever a time for Damian Warner to capture his first gold medal at a major international event, this is it. And he knows it. "I'm not here to just have fun," the Canadian decathlete said before the world track and field championships. "I'd be lying if I said that my goal isn't to win in London." For most of Warner's career, he's had a front-row seat to witness one of the most prolific decathletes of all time — American Ashton Eaton, the two-time world and Olympic champion who holds the world-record score of 9,045 points. Eaton's brilliance helped block Warner from reaching the top of the podium at the four most prestigious meets where they competed against each other, with the American winning gold each time. After placing fifth at the 2012 Olympics in London, Warner picked up a bronze medal in Rio last summer. 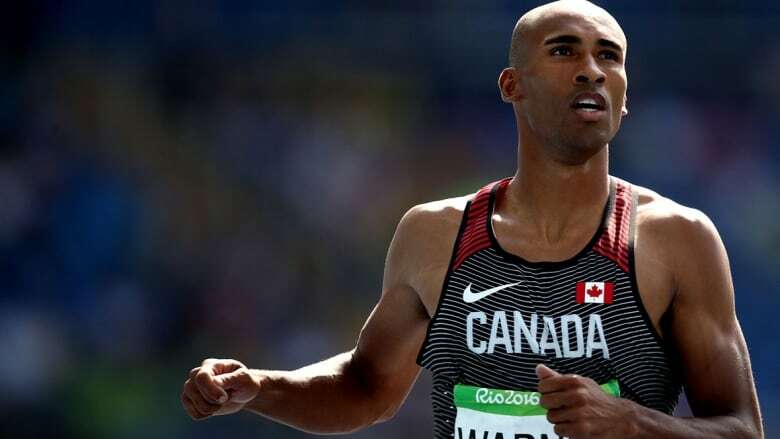 The closest Warner ever came to beating Eaton for gold was at the 2015 world championships, where he took silver. At the 2013 worlds, the Canadian finished with bronze. Should track and field erase its record book? "Every world competition I've ever been in, Ashton has always been there," Warner said. "He's an awesome competitor and brings the most out of the people competing." But that can all be put in the past tense now since Eaton retired in January. Though Rio silver medallist Kevin Mayer of France still stands in his way, the door appears more open for Warner to get that elusive gold medal as the men's decathlon event opens Friday in London. "I think he can win," says Eaton. The American has been keeping a low profile since he and his wife — Canadian Brianne Theisen-Eaton, an Olympic heptathlon bronze medallist — jointly announced their retirements last winter. "We stay up late," Eaton says with a laugh about their new life. "We hang out with friends and have seen our families more this year than the past decade." Though he has left the sport, Eaton says he'll be paying close attention to the world championships — especially the performance of his friend and former rival, Warner. "He is very much a competitor," Eaton says. "He never wants to give up, and that's very important." Eaton says what makes Warner great, and also accounted for his own success, are three components — physical ability, mental ability and the team and environment around him. "If you don't have one of those three, it's extremely difficult to be successful," he says. "If you look at any successful athlete, they'll have all three." One of those factors, the team around Warner, changed this past off season. Calling it the hardest thing he's ever had to do, Warner informed his coaches and the people closest to him that he was leaving his hometown of London, Ont., to move to Calgary and train with well-known coach Les Gramantik. "I pulled up in the car and just started crying," Warner said. "I was really scared when I talked to [the coaches]. I thought I was going to lose them as friends and family because that's what they became to me." Instead, they all supported Warner as he embarked on his new journey in Calgary, far away from the familiar confines of London. Eaton thinks it was a smart move. The American says he made little changes throughout his career to shake things up, try new things and push himself out of his comfort zone. "There is a certain learning that happens, a growth, when you change things," he says. "Learning never subtracts. So when you do change your environment, you grow. I can understand why he did that." Warner was blunt about the decision to change things up. "I had to look in the mirror at the end of the day," he said. "One of the reasons I made the move was because I wasn't as mature as I needed to be as an athlete. It's kind of a tough pill to swallow and tough thing to realize. I just felt as a person I needed to grow." Now, with Eaton out of the picture, Warner has his best chance ever to parlay that growth into a world title.